They're not actually referred to as W.I.T.C.H. other than on a few occasions - the idea of the "team name" was put forth by Hay Lin when they revealed/discovered their super powers and was promptly rejected by the others. Thanks to Hans Holm for providing this profile. Martin Joustra added the following notes "The manga version of Witch in Japan has stopped with the second issue. The comic didn't sell enough. There are indeed a few places named Heatherfield in the USA. But none of them is situated at any coastline. The town Aubry, where the car of Elyon's adoptive parents was found after their disappearance, really exists. Though Heatherfield is situated in the USA, there are indications which lead to a virtual city in the South of England. The stardrops or astral drops (in Italian they are called gocche astrali) appear to have a working mind and having emotions. Will's stardrop once refused to melt back with Will." Martin also provides some additional information on the girl's personalities and powers (added in below) and suggested this link as a good source of additional information for fans of the show. Affiliations: W.I.T.C.H., all of the groups affiliations, plus James (refrigerator), Billy (television set), George (computer), Mildred (printer (and George's wife! )), Edward (cell phone), unnamed answering machine and presumably several other devices, Stiftelsen Den Gryende Stjärnan (Rising Star Foundation - Kadma & Halinor). Base of Operations: Heathersfield, USA. Powers/Abilities: Will has been entrusted with The Heart of Kandrakar, a gem which contains the secrets of Air, Fire, Earth and Water. She has the strength of the four elements within her. She has various magical powers, including transforming into a costumed form (which is a few years older), creating a stardrop (an independent, but non-powered copy of herself), teleporting, turning herself invisible, and the ability to talk to machines (though it would be more accurate to say that she awakens them - those in her home have personalities of their own and the girls can hear them too) and animals. Will is also a champion swimmer. History: Will moved to Heathersfield from Fadden Hills (in the first issue) when her mother got a job at Simultech. Her parents were relatively recently divorced and her mother appeared to be dating the girls' history teacher, Dean Collins. Her father was a bit of a creep, and at one point tried to blackmail her mother into paying off his debts by threatening to get custody of Will. She later learned that two of the previous guardians, Kadma and Halinor, had been watching, and to some degree guiding/directing, her life for years through a foundation. Comments: Created by Elisabetta Gnone. Thanks to Adrienne Ross for confirming Will's correct full name. Powers/Abilities: Irma controls the power of Water. She has various magical powers and is, among other things, capable of transforming into a costumed form (which is a few years older), creating a stardrop (an independent, but non-powered copy of herself), teleporting, turning herself and others invisible and transforming people into toads. The first power she demonstrated was limited mind control over her teachers - making them ask her on the bits she'd actually studied. She also possesses a "kind of clair-reconnaisance". History: Irma was one of a number of teenage girls who discovered they had magical powers and became a member of W.I.T.C.H. She loves to listen to music. Her favorite artist is Karmilla, and she knows the songs very well, including those of Cobalt Blue, the rock group of Matt Olsen. Comments: Created by Elisabetta Gnone. Thanks to Alex Peters for providing the name of Irma's father. Powers/Abilities: Taranee's element is Fire. She has various magical powers, capable of transforming into a costumed form (which is a few years older), creating a stardrop (an independent, but non-powered copy of herself), teleporting, and turning herself invisible among other things. Taranee originally needed glasses, but eventually her powers fixed her eyeproblems. She still wears (non-corrective) glasses, though, since she can't really tell anyone except the others that she doesn't need glasses anymore. History: Like Will, Taranee moved to Heathersfield with her family, but in their case from Sesamo. Her mother was a judge. Taranee briefly left the group, being upset with the Oracle for not telling them everything (like the glasses-thing above), and was replaced by Orube. Powers/Abilities: Cornelia has control over Earth. She has various magical powers and is capable of transforming into a costumed form (which is a few years older), creating a stardrop (an independent, but non-powered copy of herself), teleporting, turning herself invisible, telekinesis, making plants grow rapidly and controlling their movements. The first power she demonstrated was telekinetically cleaning her room. 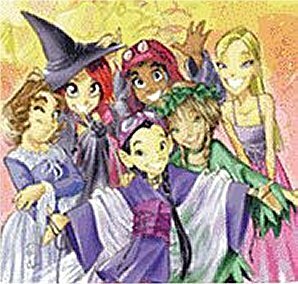 History: Cornelia was one of a number of teenage girls who discovered they had magical powers and became a member of W.I.T.C.H. Powers/Abilities: Hay Lin has the power of Air and can control winds. She has various magical powers, including the abilities to transform into a costumed form (which is a few years older), create a stardrop (an independent, but non-powered copy of herself), teleporting and turning invisible. Although all the girls have wings on their costumes, Hay Lin is the only one who can actually fly. History: Hay Lin's grandmother was one of the previous set of guardians, and, apparently dying early in the series, is now one of the Sages of Kandrakar. Her family runs a Chinese restaurant, which she sometimes helps run. Hay Lin loves Science Fiction; sometimes an Enterprise (Star Trek) model can be seen in her room. She also designs and makes her own clothes. Thanks to Mariel Mendoza for naming Hay Lin's parents.